This year marks the 57th edition of the IFA consumer electronics trade show. A lot has happened in IFA’s near century-long history; its name, organizers, location, and exhibitors have changed again and again since 1924. One thing, however, has always remained the same and helped the trade show grow, and that’s this: Each year at IFA, electronics manufacturers present their latest consumer innovations, attracting attention from all over the world. Samsung has presented its technical innovations in Berlin since 1991, and is one of the most prominent exhibitors at IFA today. These were the words with which one of IFA’s most famous guests, Albert Einstein, opened the “Great German Radio and Phonographic Exhibition” – as IFA was originally known – in Berlin in 1930. The radio – the latest and, arguably, most important technical achievement in mass communications at that time – was the star of the show, and Einstein himself presented the exciting new technology to event attendees. The first IFA trade show took place in December of 1924. The inaugural event gathered a total of 242 exhibitors, who fascinated crowds with their latest technological innovations for a total of twelve days. The trade show was held each year until 1939, when the outbreak of WWII and the subsequent reconstruction forced it into hiatus. IFA made its return in Düsseldorf in 1950 and, on its 20th anniversary, in 1957, moved to Frankfurt and added “television” to its title. Reconstruction operations in Germany would lead IFA to shift its location from Frankfurt to Stuttgart and then Berlin, only to return to Düsseldorf in the end. Since 1971, the trade show has taken place exclusively in Berlin, under the official name of “Internationale Funkausstellung” – hence “IFA”. gfu, a corporation that promotes the advancement of consumer electronics, came onboard two years later, and has been organizing IFA2 ever since. The innovation cycles of many products have grown shorter and shorter over the years, and eventually, in 2005, IFA became an annual event. 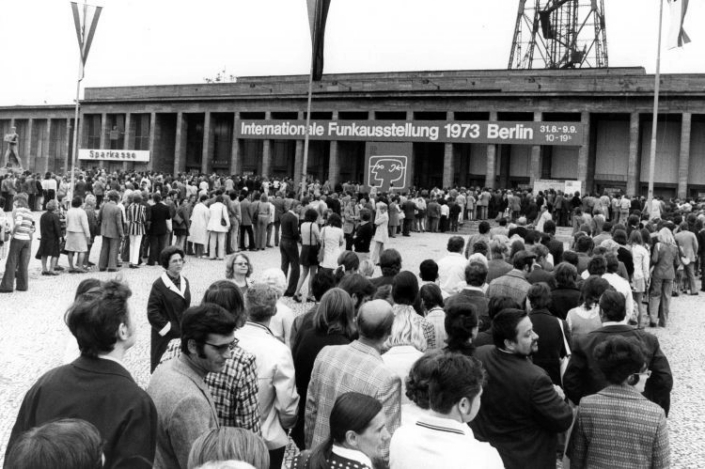 Queues at the opening of IFA in 1973. Source: Messe Berlin. Samsung has been a fixture at IFA ever since it first exhibited at the trade show in 19913. During that IFA, 26 years ago, Samsung presented screens and televisions in a 660-square-meter space. 2003 marked an important juncture in Samsung’s relationship with IFA. A move to Hall 20 meant that a substantially larger exhibition space would be available, turning Samsung into one of the show’s major exhibitors. With keynote speeches in 2003, 2006, 2008, 2009 and 2014, Samsung strengthened its position as a global brand, establishing ground-breaking technologies and setting future trends. In 2008, for example, Park Jong-Woo, the then-President of Samsung Electronics Digital Media, predicted that the entertainment industry would take a gigantic leap forward by seamlessly networking a variety of devices. Nowadays, smartphones and tablets easily hook up to users’ TVs and Bluetooth speakers, and even some fridges and washing machines can be controlled on the go. (Clockwise from top left) Samsung’s IFA booths in 2006, 2009, 2010, 2011, 2012 and 2013. Samsung has been one of IFA’s largest exhibitors since 2003. 2014 saw the opening of CityCube Berlin, which IFA’s host venue, Messe Berlin, invested over 83 million euros to build. Samsung moved into the three-story cube – which, along with featuring the largest product-exhibition space (approx. 6,000 m²), also houses several rooms (approx. 2,500 m²) for presentations and sales meetings – as soon as it was completed. The location has been used exclusively by Samsung at IFA ever since. More exhibition space also opens up new possibilities. Samsung’s individual product divisions were previously presented spread across several halls, but the move to CityCube Berlin meant that they could be showcased under one roof. Today, Samsung has become IFA’s largest exhibitor, with 8,700 square meters of hall space. In 2016, Samsung impressed IFA attendees with this TV installation at the heart of CityCube Berlin. Picture quality remains one of the most important focuses for TVs, and is one of the hottest attractions for the trade show. Over the last eight years, the TV industry has mastered the leap from HD to Full HD to UHD resolution – each of which has been successfully established in the mass market. IFA has also served as a popular showcase for introducing new product categories in other areas. In 2010, Samsung presented its first tablet to the world with the Galaxy Tab. One year later, the Galaxy Note marked the beginning of large-screen premium smartphones, or ‘phablets’. Samsung’s first smartwatch, the Galaxy Gear, was introduced in 2013, laying the foundation for Samsung’s smartwatch portfolio. And in 2014, the Galaxy ecosystem was further expanded with the Gear S and Gear VR. 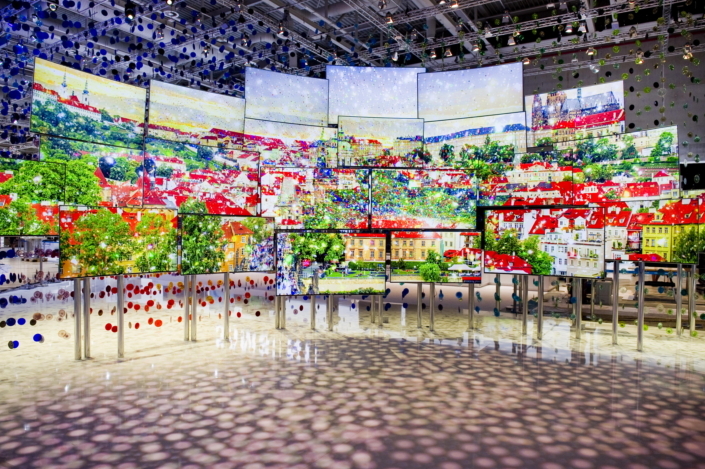 This year, too, visitors to Samsung’s IFA booth are treated to a great many innovations and technical highlights, such as QLED TV, The Frame, the QuickDrive™ washing machine, Family Hub refrigerator, mobile devices, portable SSDs and more. 2With the exception of 1985, 1987 and 1989. 3Samsung did not attend IFA in 2004.